The Boeing 777 is a long-range, wide-body twin-engine airliner built by Boeing Commercial Airplanes. The world's largest twinjet and commonly referred to as the "Triple Seven", it can carry between 283 and 368 passengers in a three-class configuration and has a range from 5,235 to 9,450 nautical miles (9,695 to 17,500 km). Distinguishing features of the 777 include the six wheels on each main landing gear, its circular fuselage cross section, the largest diameter turbofan engines of any aircraft, the pronounced "neck" aft of the flight deck, and the blade-like tail cone. As of May 2008, 56 customers have placed orders for 1,080 777s. Direct market competitors to the 777 are the Airbus A330-300, A340, and some variants of the A350 XWB, which is currently under development. 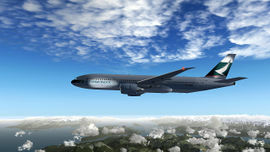 The Boeing 777 is an advanced fly-by-wire aircraft, and the systems are moderately complicated. The video below is a brief introduction of the Boeing 777's new system of the new Seattle Project working with FlightGear Version 3.2 Test Release. The Boeing 777 series are fly-by-wire aircraft and like all Boeing aircraft have yokes. The signals are sent electrically to the hydraulic actuators which move the control surfaces. This section is a stub. You can help the wiki by expanding it. The current Boeing 777 hydraulic system is basically working, it will be expanded in the future for more realistic behavior. The Left hydraulic system is powered by an engine driven pump (EDP) and supplemented by two on-demand Electric motor pumps (ACMP). It operates wing & tail flight controls (ailerons, elevators, rudder) and left thrust reverser operation. The Right system is powered by by an EDP from the right engine and supplemented by an ACMP. It operates flight controls, right thrust reverser operation and the normal brake system. The Center system is powered by two ACMP's and supplemented by two on-demand air turbine-driven pumps (ADP). It operates the landing gear actuation, nose & main gear steering, flaps & slats, flight controls and the reserve brake system. When no engine is running, the APU (if running) and/or Ground Power (if connected and activated) provide power to the center system's ACMP's. Make sure the ACMP's are on when you want to use the center system on APU/Ground Power. A realistic Ram Air Turbine (RAT) and reserve system have yet to be modeled. 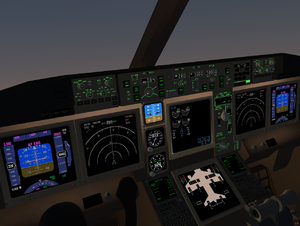 You can also use the 777's built-in autopilot tutorial to learn about the different switches. A/T ARM (L/R) - Arm/disarm autothrottle for left/right engines. Must be armed to enable autothrottle for the respective engine. A/T - Autothrottle engage/disengage button. Like the real 777, the autothrottle is independent from the main autopilot, so autothrottle also also works when the autopilot is disabled (Note: this was different for FG2.0 and earlier!). LNAV - Tells the autopilot to follow the Route Manager settings laterally (control the heading). VNAV - Same as LNAV, except vertically (control the altitude). The autopilot will climb to the flight level you set in the Route Manager (in the input field or at a specified waypoint). FLCH - Flight Level Change, set the altitude and press FLCH to climb or descent to designated flight level. Thrust is set to a fixed value, speed is controled with pitch. A/P DISENGAGE - Dedicated autopilot disengage button (click twice). It serves as an easy to reach "emergency disengage" button. HDG window - Set your desired heading or course track here. HDG select - Engage/disengage heading or course hold mode and maintain SELECTED heading (FG2.5.0 and newer). Bank limits (AUTO/5/10/15/20/25) - Define banking limits for turning, i.e. 5 for gentle turns at cruising altitude, 25 for good maneuverability at lower speeds; auto will be fine in most cases. HOLD - Engage/disengage heading or course hold mode and maintain CURRENT aircraft heading. APP - Arm the ILS localizer and glideslope (laterally and vertically). Any current AP mode (HDG and ALTITUDE HOLD) remains active, until the NAV receiver captures the localizer or glideslope. HDG HOLD mode: Maintain heading when engage. ATT mode: If bank angle exceeds 5deg when engaged, keep that bank angle. (there's bug, will be fixed) VS mode: using vs value when engaged. If FD mode was engaged, mode is inherited. HDG HOLD: keep set heading. HDG SEL: follow the heading set on counter. Change value when HDG HOLD or press SEL button when other mode such as VNAV, LOC mode. Once reach to setting heading change to HDG HOLD. LNAV: follow the activated route. LOC: when arming, keep previous mode and then capture LOCALIZER, follow that course. VS : keep targeted vertical speed to reach selected altitude. FLCH : keep fixed climb thrust or flight idle and control the pitch to maintain speed thus vertical speed varies. VNAV : Follow the FMS target altitude and thrust. ALT HOLD : When you press HOLD button, keep altitude when button pressed. Counter value does not change. Once VS of FLCH reaches targeted altitude, it holds that altitude. Hold the 's' button for 10 seconds or until the engines are running at idle. a) turn on the battery, taxi lights and panel lights if you need it (button is placed) to tle left, left from the BCN light button. pumps MUST be enabled), the same with the other two, they are for landing gear. the buttons are between electrical and fuel part of the panel. a) start fuel pumps. there are 6: 2 for each tank. to enable fuel flow from a tank, you have to enable BOTH (just like with the hydraulics) pumps. c) after N1 reach ~45, engine should be running on its own, self sustaining, fuel cutoff valves open automatically. eicas shows up a message that L(R) ENG STARTER is on. c) fuel flow is 30 gallons per second. a) enable FWD xfeed pump and AFTER IT enable AFT pump. if you mess this, it wont work and you will have to repeat. b) watch the fuel indicators on the eicas as the fuel level gets equalized in both tanks, left and right. c) fuel flow is set to 4 gallons per second. Important notice: as of FlightGear 2.4.0, the 777 has tiller steering, just like the real aircraft where the pedals only turn the nose wheel by a few degrees - to achieve optimal precision during takeoffs and landings. Use the tiller (777-200ER > Tiller Steering) dialog to steer during taxiing. You can also connect a separate joystick axis to the tiller control - just like in the real aircraft, where there is a separate control wheel. Finally, you can also disable the separate tiller control and revert to the unrealistic behaviour of using pedals only to completely control the nose wheel (see 777-200ER > Tiller Steering dialog). 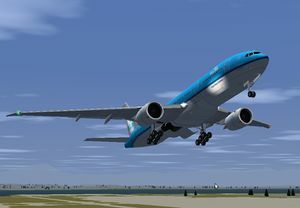 You can see a guide on how to fly this plane for Flightgear 2.0 at Boeing 777 Tutorial: Version 2.0..
All FlightGear liveries are available at FlightGear Liveries. The Boeing 777-200 (772A) was the initial A-market model of the Boeing 777. The first customer delivery was to United Airlines in May 1995. It is available with a maximum take-off weight (MTOW) from 505,000 to 545,000 pounds (229 to 247 tonnes) and range capability between 3,780 and 5,235 nautical miles (7,000 to 9,695 km). The Boeing 777-200LR ("LR" for Longer Range), a variant of the Boeing 777, became the world's longest-range commercial airliner when it entered service in 2006. Boeing named this aircraft the Worldliner, highlighting its ability to connect almost any two airports in the world. It holds the world record for the longest nonstop flight by a commercial airliner, and has a maximum range of 9,380 nautical miles (17,370 km). 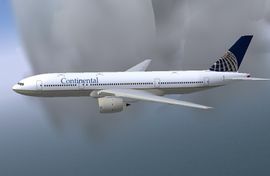 The 777.200LR was intended for ultra-long-haul routes such as Los Angeles to Singapore. The -300 features a 33.3 ft (10.1 m) fuselage stretch over the baseline -200, allowing seating for up to 550 passengers in a single class high-density configuration. The 777-300ER ("ER" for Extended Range) is the B-market version of the -300. It features raked and extended wingtips, a new main landing gear, reinforced nose gear, and extra fuel tanks. The 777 Freighter (777F) is an all-cargo version of the twinjet, and shares features with the -200LR; these include its airframe, engines, and fuel capacity. With a maximum payload of 226,000 lb (103,000 kg), cargo capacity is similar to the 243,000 lb (110,000 kg) of the 747-200F. The freighter has a range of 4,900 nmi (9,070 km) at maximum payload, although greater range is possible if less cargo weight is carried. As the aircraft promises improved operating economics compared to existing freighters, airlines have targeted the 777F as a replacement for older freighters including the 747-200F and MD-11F. 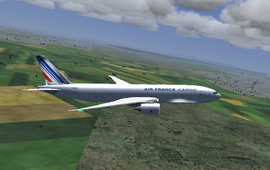 The 777 for Flightgear is based on 777-200 developed by Justin Smithies, Syd Adams. This page was last modified on 14 July 2017, at 08:31.